There is a graphic I saw posted via social media that grabbed my attention, mostly because I felt the urge to shout “preach!” while also recognizing that beyond its simplicity, there is more to the story. What I love about this graphic are two things. First, it’s basically true. Second, it turns most “conventional wisdom” about weight loss on its head. I’ve been told this by fitness experts and read it in books and articles: 80 percent of weight loss depends on what you do in the kitchen. Or the drive-thru. What you eat and how you eat dictates how successful you will be in trimming unwanted pounds. If you don’t believe me, just go to your local gym and take a look at the cardio drones churning away on treadmills, ellipticals and stationary bikes. Some of these people will pound out an hour or more on those machines, and yet weeks and months of this result in very few visible changes. Why? Because they eat crap. They might modify their diet a little, perhaps eat a little less or add some more veggies. But their habits remain basically the same, often with the justification that all the exercising they’re doing should nullify the extra beer after work or that Sunday lunch at Cracker Barrel. Never mind that they’re still consuming copious amounts of starches (breads, potatoes, etc) and fats, and their portion sizes are woefully underestimated. I’ve been guilty of this. Big time. I exercise six times a week minimum, and my workouts can be pretty tough. But I didn’t drop 17 pounds until I changed the way I ate. By getting the correct amount of protein and fruits/vegetables in my diet (typically 5-8 serving of fruit/veg a day) while cutting back on starches, bad fats and “liquid calories” (read, sugary drinks and alcohol) the weight came off without sacrificing strength and overall athletic performance. I took those portion sizes down, too. And that made the biggest difference. I can now honestly say I’m on a 2,000-calorie per day diet. I used to say that, but not realizing it was 50-75 percent higher than that, or more, because I wasn’t correctly judging my food intake. So I will conclude with this: If you get your diet in line and stay active, you won’t need to spend two hours a day lifting weights and an hour on a cardio machine. In fact, you can get by exercising six days a week, with three lifting days (45 minutes per weight training session) and three cardio days (20-minute high-intensity interval cardio sessions). Did you catch that? Just three cardio sessions a week, and all three add up to one measly hour. Bill Phillips made a fortune with his Body for Life program based on that formula. Correct nutrition, combined with a well-designed training program, yields better results than massive loads of exercise that lacks dietary discipline. 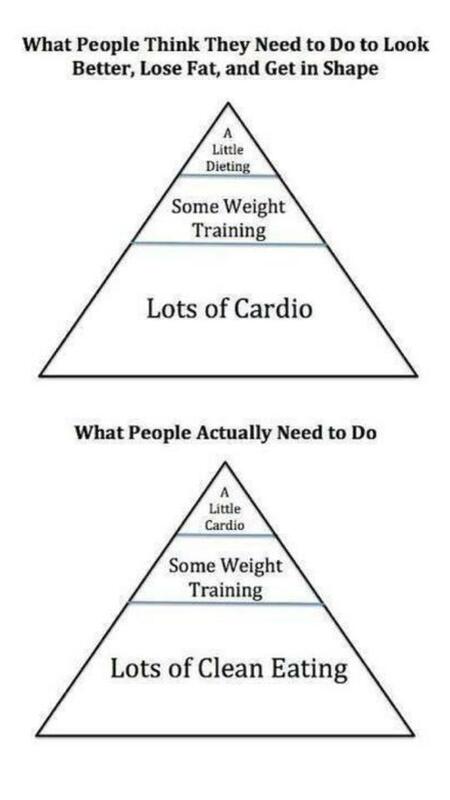 Your own ratio of cardio to other things on that diagram will greatly depend on what your goal is. And believe me, this has far-reaching implications. If “getting in shape” means building up your muscles and shedding body fat, the diagram’s message rings true. A little bit of cardio, some solid strength training and clean eating will do the trick. But if “getting in shape” means running your first 5K, or marathon, or triathlon, well buddy, you’ve got another thing coming. A healthy cardiovascular system is developed by strengthening your heart, lungs and muscles, in tandem, to do work over time. In that scenario, “a little cardio” won’t cut it. When I was big into doing only HIIT cardio, I could scarcely run two miles. Sure, I was lean. But longer-term endurance waned fast. I could recover quickly if I stopped but those bursts of sustained effort just didn’t last long. It was only after I committed to putting more serious time on my feet, pushing my body past previous cardio comfort zones, that I was able to increase my speeds and distances. And yes, if you pound out 15 miles of running trails, you’re gonna burn a boatload of calories and drop weight. 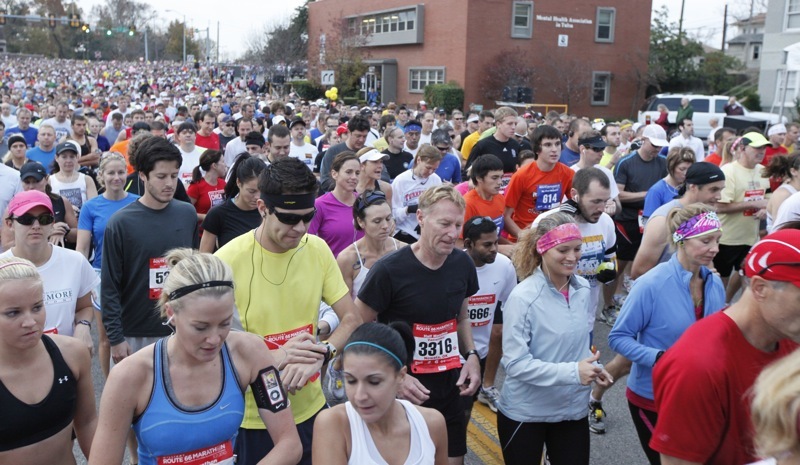 You’re not going to complete a marathon by skimping on cardio. Same goes for a triathlon, a half-marathon, an ultra or a sizable cycling event. To get in race shape, you have to aim high on your cardio. The same could be said for mountaineering, or at least mountaineering among peaks that have any sort of real elevation. A clean diet and a bit of exercise will help, but trust me — you want serious cardio under your belt when you’re toiling away above 10,000 feet. There are plenty of other sports where serious cardio sessions are required. Basketball players run lots of laps and line drills. Fighters — be they boxers, mixed-martial artists or wrestlers/grapplers, spend a good amount of time pounding out the miles if they have any serious aims at lasting into the later rounds. I could go on, but you get the point. 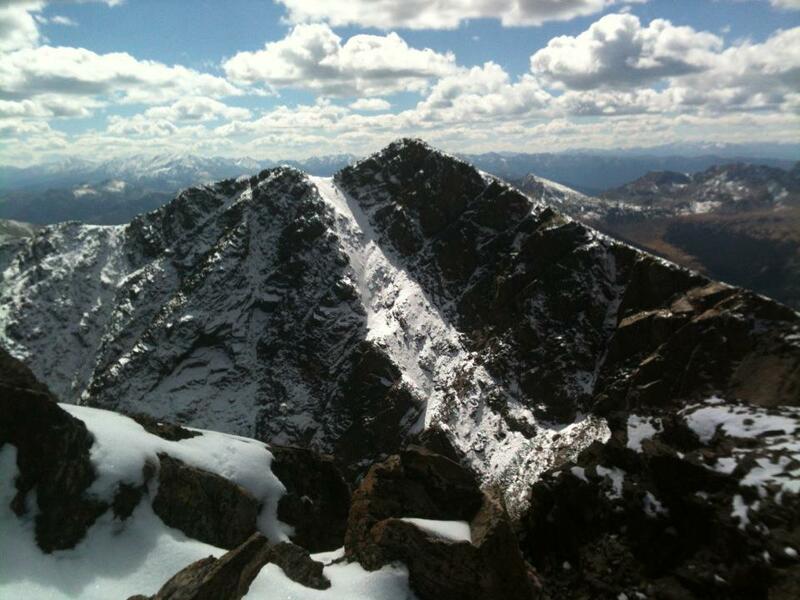 Want to get to the summit of this mountain? You’ll need more than token cardio in your training. One thing to know that is universally true about the diagram above: Clean eating just makes you physically better, whatever your training regimen or sport happens to be. Just like a rotten diet and bad habits (drugs, frequent drunkenness, smoking) will sabotage anything you do. But my hope is that people will look beyond the simple statement of “this is the truth!” and understand that the process of “getting in shape” is very sport-specific. There is no such thing as a universal fitness program. A power lifter or body builder will not train like a wrestler or a marathoner. And for my friends who are would-be endurance athletes, just remember that you cannot skimp on your cardio, no matter how forcefully some argues that cardio training is overrated. This entry was posted in fitness, nutrition and tagged cardio, exercise, fitness, health, nutrition, weight training. Bookmark the permalink. Love the diagram! It is true that you can’t skip cardio if you want to get fit, but you also see alot of very fit runners who are not super lean. White carbs can really affect your body fat percentage even if you run big miles. It is a sad fact that running/ cardio doesn’t give you a pass to eat whatever you want. and weighing a few extra pounds makes running even harder! Good take. I advocate runners lifting weights or doing some sort of strength training. It just makes sense, in addition to eating smart. I worked with a dietitian a few years ago and she opened up my eyes. Losing weight is all about the eating not so much the exercise. And the eating involves eating foods that count and getting rid of the junk. Me as well! Diet is huge. Strength training and cardio should be sport/goal specific. There’s no such thing as a universal training program. But there is always such thing as good, clean eating. Good fuel=good life. Thanks for reading and commenting!